1 foil stamped area on Side 1 of uncoated 100lb Dark Blue Linen stock. H1 business card slits on flap. White Velcro® closure. Stamped in metallic silver, the brand logo and slogan for Coltrane, Grubbs & Whatley shimmer and shine. The foil's reflectivity adds a tasteful element often associated with luxury and quality. Navy blue panels have a visible linen texture that offsets the smooth foil, creating a memorable tactile experience for recipients. Their dark color also sets a professional tone worthy of a law firm. A Velcro® closure ensures no important documents escape the pocket. 1 PMS color printed on Side 1 of uncoated 100lb White Linen stock. H1 business card slits on flap. White Velcro® closures. 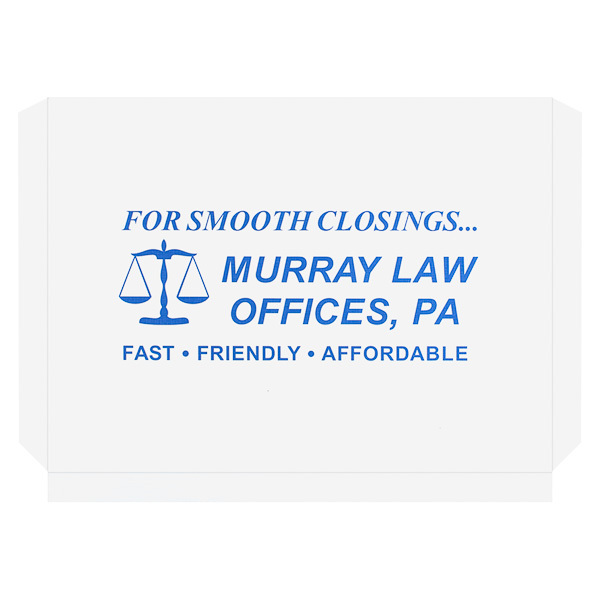 Murray Law Offices helps real estate clients through the closing process with this minimal design. Simple blue type on white panels looks clean and professional, while blank lines on the flap let attorneys stay organized by labeling each client's papers. On the pocket exterior, the law firm's name is centered among the contact information for its four branches, while a second tagline describes the firm's dedication to its real estate practice. Side 1 printed with 1 PMS color using light coverage. 90lb White Cordwain stock uncoated. White Velcro® closures. 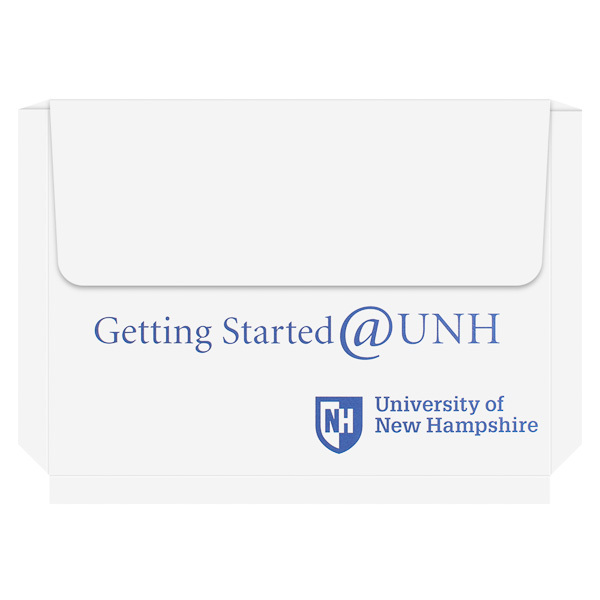 The orientation pack welcomes admitted students to the University of New Hampshire. Its white panels and blue type reflect the school's colors. White appears fresh and professional, while blue adds a sense of establishment and respectability. UNH's shield logo also appears at the bottom of the pocket exterior to help students get excited about their new academic careers. 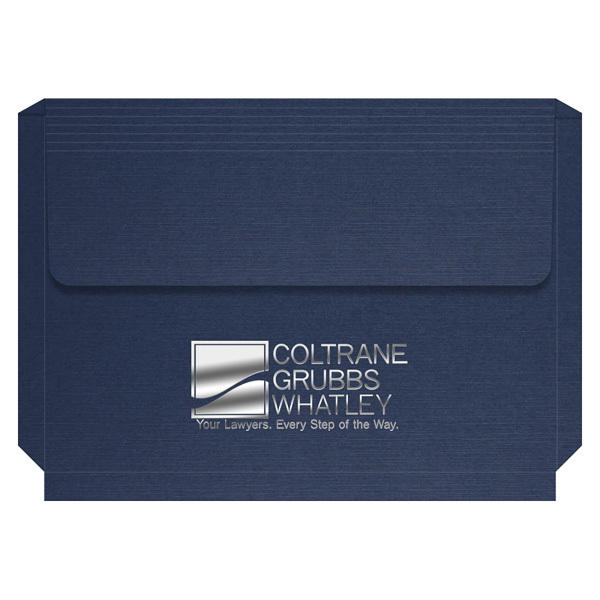 This product expands to an impressive 1 1/2" carrying capacity for 11" x 8 1/2" documents. The unsealed gusset allows panels to lay flat whether the pocket is fully extended or carrying a single sheet of paper. Select elastic bands or Velcro® closures in your choice of black or white to keep the 3" flap closed, no matter how much jostling the product may encounter. Both the outer panels and sides are customizable with branded information or original graphics. Dimension Closed: 12" x 9"
Dimension Open: 12" x 13 1/2"